The Esee PR4 immediately catches your eye with a micarta handle featuring deep sculpted grooves. A blade finish that is certainly out of the ordinary and is a stunning piece of equipment overall. I have had the privilege of using such a sought after knife out and about over the past few months. As the seasons change from winter to spring, so do our tasks in the woodland, and the PR4 has been more than able to keep up with this evolution. 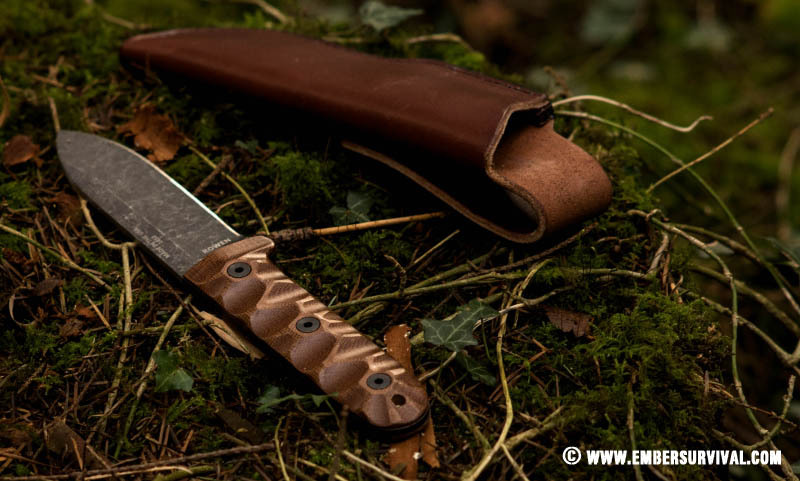 The Esee PR4 is part of Esse’s new Camp Lore range of knives for the discerning outdoors person. 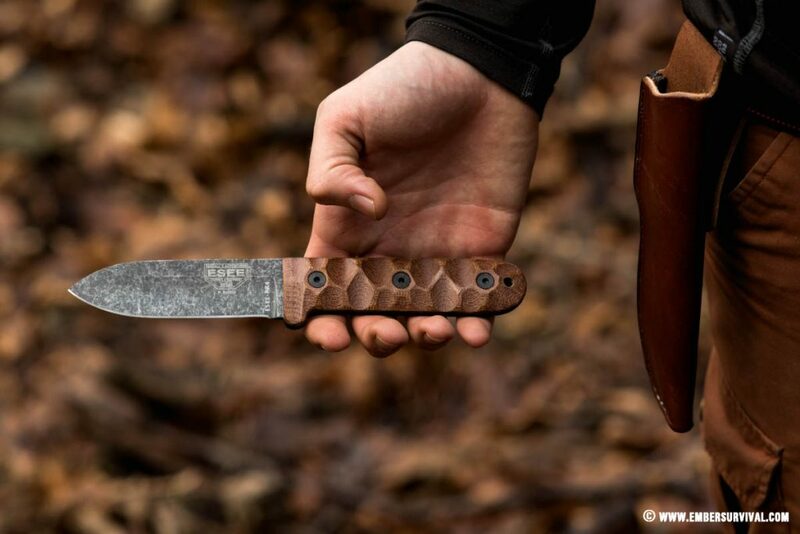 The Esee PR4 is inspired by a chap called Horace Kephart, whose ‘Kephart’ Sheath Knife was synonymous with backcountry hikers and hunters. Colclesser Bros in Pennsylvania made the original ‘Kephart’. 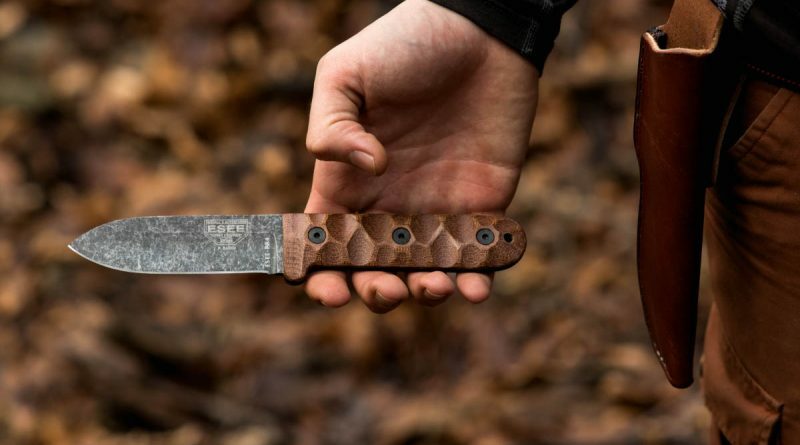 It featured, at first glance, a very basic design which hid its refined features that Kephart himself saw as the most useful parts of an outdoor knife. Esee PR4 makes quick work of making feathersticks. Horace Kephart died April 2nd 1931 and during his life wrote many famous books such as the classic ‘Camping and Woodcraft’ and ‘Our Southern Highlanders’. “A lot of us are working harder than we want, at things we don’t like to do. Why?. It figures! In order to afford the sort of existence we don’t care to live” Horace Kephart. “The man who goes afoot, prepared to camp anywhere and in any weather, is the most independent fellow on earth” Horace Kephart. A couple of quotes from Horace that strikes a cord deep within. It is with this powerful philosophy that Horace designed his sheath knife. A knife with at first glance a simple design but one that has everything you need and nothing you don’t. 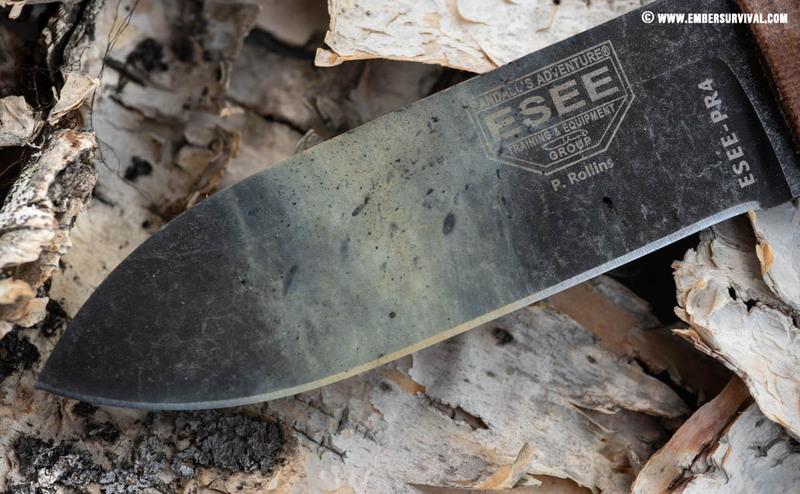 Esee has taken on the challenge of bringing this classic design to the modern day with a chap called James Gibson making a prototype and then Esee’s own Patrick Rollins taking it out into the field to test and trial the knife. The finished product is a 4″ blade with a 4.75″ handle, 1/8″ thick 1095 High Carbon steel blade, 90 degree spine for striking a Ferro rod and a simple leather pouch sheath made of thick leather. The sheath can be worn on the belt but has no drop loop option. The sheath is simple and strong. Continuing a tradition is one thing, but the true test of an outdoor product is how well it performs in the field. The idea of the original sheath knife is for powerful simplicity and with its modern interpretation Esee brings this design into the present day with its PR4. 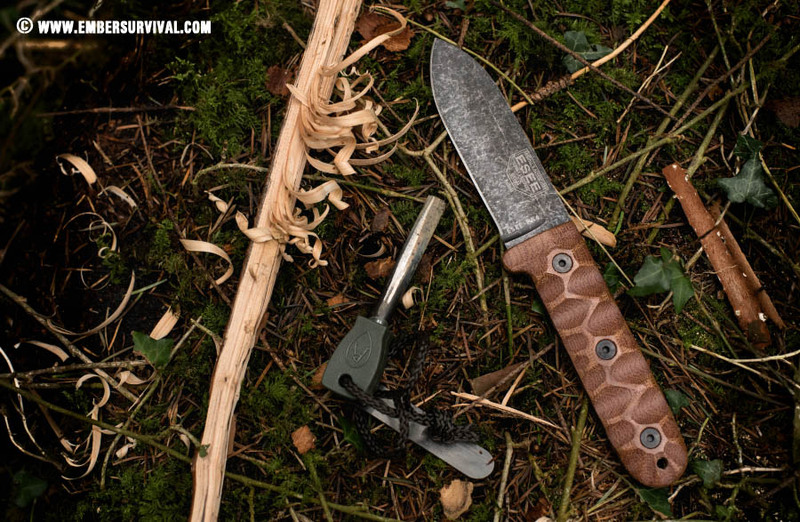 The Esee PR4 is a survival and backcountry knife for the outdoors person travelling anywhere and needing a solid tool to rely on. The sheath grips the knife well and allows the knife to be pulled out without over exerting yourself. This is hard to get right as some sheaths are either too loose or too tight in gripping the knife and the result of this miscalculation is that you have to divert your attention to get the knife out. If a sheath doesn’t hold your knife well enough then you will be always worried of it falling out, this is very distracting. Esee gets it perfect in the PR4 and the sheath grips the knife in an ideal fashion. The sheath is strong and made of thick leather and features a simple belt loop that is well stitched. It has a drainage hole so water is not allowed to pool within the sheath. 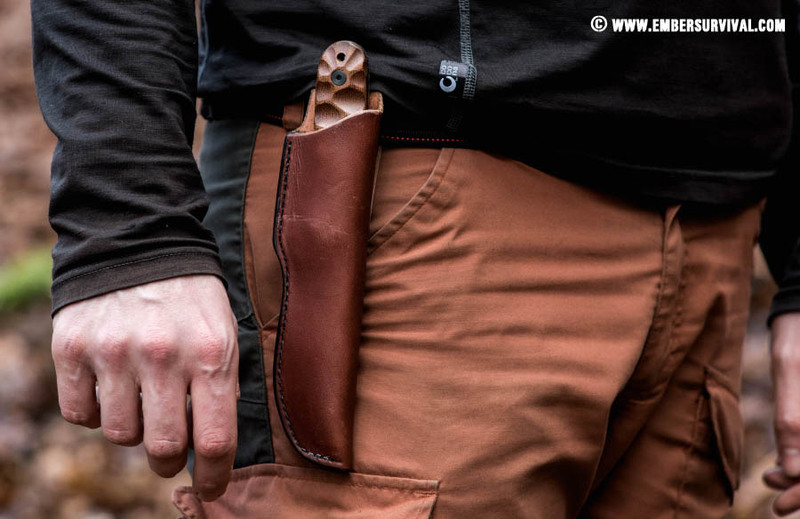 Kephart’s philosophy is visiable in the sheath as it is simple, strong and reliable when out in the field. The handle is made of micarta. This is probably the feature you will notice first when you see the knife. Those deep grooves and striking design really standing out. The handle is smooth and after use doesn’t produce any hot spots with my hands but I do have a preference to large palm swells and the PR4 features very slim scales. The result of this is you have to hold the handle a little tighter than if the scales were thicker. The original ‘Kephart’ Sheath knife also featured very thin scales and in my understanding this could be to reduce the footprint of the product. The PR4’s handle is of a good length and works well with gloves. The advantage of micarta for a handle material is that it is indelible and resists change in temperature. This well chosen scale material makes the Esee PR4 very versatile for world wide travel as whatever the local conditions may be the scales will perform as expected. Moving to the blade, it’s made from 1095 carbon steel and hardened to RC 55-57. Carbon steels are known to hold an edge well and be very strong when biting into material. However they do rust if left untreated but this is easily overcome by regular oiling. If you know you will be operating in a very corrosive place such as a coastal environment then you may need to look for a more stable metal. Carbon steel is very good at working with natural materials and is an excellent choice for work in woodlands. Above all it’s a much harder steel. The blade is finished in a tumbled black oxide which has held out very well in terms of protecting the blade and is one of the best finishes I have used. Esee were already strong in this category with their powder coatings but they seem to have yet again outdone themselves with another great finish. Using a knife to make fire is always a great test for an outdoor blade. Having the Esee PR4 on your belt you feel your back is covered. It feels like the perfect weight is sitting on your side just waiting to be put to use. 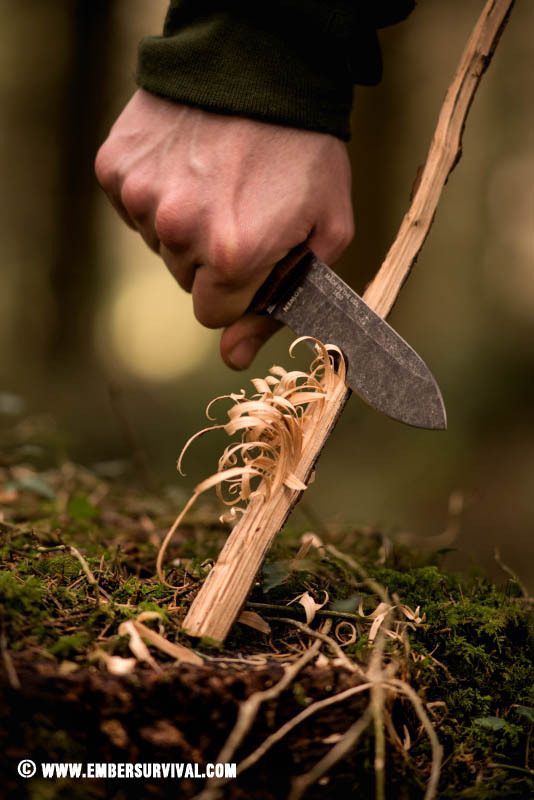 Using the knife to baton down some kindling you really appreciate the full tang design, the PR4 feels very balanced in the hand with the knife being a little handle heavy so it stays in the hand well. The grooves on the scales also allow your finger tips to slot into a nice space to help you secure the knife in your hand and helps with the ‘feel’ of the knife. The finish on the blade resists abrasion from battoning. The hardened carbon steel bites into the wood well and can produce some nice feathers. The spine has a 90° grind. For instance this can be used to scrape fine tinder or a firesteel to produce a shower of sparks. With the fire lit the PR4 can now be used for food prep. Its unusual knife geometry is well suited for game prep and simple vegetable chopping. Kephart wanted his knife for everything and this included the basic tasks that happen most often, like peeling potatoes! Use of a firesteel with the ridgeground spine is very effective. The resulting ash that collects on the knife can be easily cleaned off. He was talking about his beloved ‘Sheath’ knife and I am starting to feel the same about the PR4. A trusted companion out in the backcountry. For one of the most comprehensive and multi disciplined outdoor training schools one can visit Randall’s Adventure & Training School.